An ex-militant in Nigeria's oil region Tuesday led a march of over 1,000 youths and warned of a possible return to armed struggle if conditions did not improve in the impoverished delta. 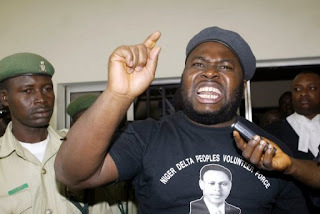 Mujahid Dokubo-Asari, head of the Niger Delta Peoples Volunteer Force, said during the march that armed struggle would be a last resort for his group if President Goodluck Jonathan did not take action in his native region within one year. Jonathan, who won last month's presidential election, is the first head of state from the Niger Delta, the heart of one of the world's largest oil industries. "We are on sabbatical," he said during the march in the oil hub of Port Harcourt, correcting someone who asked about his group having given up armed struggle. "We are giving Goodluck a chance to make a difference to bring about change ... Goodluck does not have four years. He has one year." He added that "armed struggle is a last resort." Jonathan, first thrust into office following the death of his predecessor Umaru Yar'Adua in May 2010, has stirred hope in the region by winning last month's election. The Niger Delta, a vast area of swamps and creeks badly polluted by oil spills, saw years of unrest before a 2009 amnesty deal. While the amnesty has been credited with greatly reducing unrest, many have warned that fundamental problems of deep poverty, unemployment and widespread corruption could lead to more violence. Asari, whose group was involved in violence particularly in the early part of last decade, called for a conference to look at whether communities in the Niger Delta should be given some type of sovereignty. Tuesday's march was also held to commemorate the life of Niger Delta activist Isaac Boro, who died in 1968. Asari, from the mainly Christian Ijaw ethnic group but who converted to Islam, continues to have a significant following in parts of the region, but his precise intentions are unclear. Some have speculated that he may be seeking to gain more leverage over the government, with other militant leaders having recently been more prominent. Asari was at one time perhaps Nigeria's best known militant leader. Violence in the Niger Delta has been carried out by militants claiming to be fighting for a fairer distribution of oil revenue as well as criminal gangs. Asari's group, along with others, was accused of involvement in Nigeria's lucrative illegal oil industry.